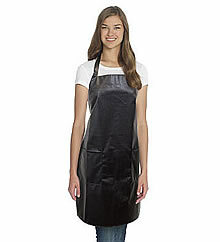 The Diane 7002 Lightweight Waterproof Apron fits most. A protective durable polyurethane apron with embossed print. Has adjustable neck and waist ties. Machine was cold, drip dry. Do not iron.